What's new, pussycat? A lot for Selina Kyle. Having faked her death, as well as that of her alter-ego, the Catwoman, Selina finds herself in a bind when a heist goes sour. Out of money and out of contacts, she returns to Gotham City to begin her old life in a new way. Catwoman: Volume 1, Trail of the Catwoman is a collection of several story arcs, covering Darwyn Cooke's graphic novel Selina's Big Score, back stories from Detective Comics and Catwoman issues 1-9, authored by Ed Brubaker. This is collection is cohesive and meaty, just the way I like them, and well worth the $29.99 (although I read the library's copy. I may just buy one for myself sometime). Selina's Big Score begins the new Catwoman saga, as she returns to Gotham, gets word of a big score and puts together a team for the heist. It has the feel of a Parker novel, and it's probably no coincidence that Selina teams up with a guy named "Stark" with whom she has a history, a neat little homage to Parker. Darwyn Cooke's writing is great and his art has a nice retro feel, with broad brushstrokes, simple colors and crisp chiaroscuros. It also has a bit of a rough edge, which I welcome in today's world of overly-polished, computer-assisted comic art. "Trail of the Catwoman," also by Darwyn Cooke, is a related story arc, that features Slam Bradley, the hard-boiled private investigator, who is hired by the mayor of Gotham to investigate the death of Catwoman/Selina Kyle. In doing so, Slam is exposed to the dark underbelly of Gotham corruption. Slam's a real cool character and tougher than leather. I like this guy a lot. 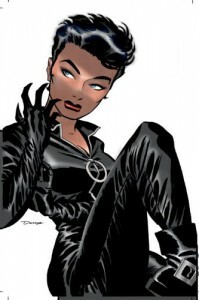 The stories from the Catwoman comic are "Anodyne" and "Disguises," both written by the excellent Ed Brubaker and illustrated by Darwyn Cooke and others. The stories do a good job of showing how dark and seedy Gotham City really is, as well as Selina's perspective of it. For example, Batman makes an brief appearance, but he sort of comes off as a bit of a self-righteous prick, which I guess sort of makes sense from Selina's street-wise, grayscale perspective. Catwoman: Volume 1, Trail of the Catwoman is a great book. I'm looking forward to reading the second volume. (By the way, saying "What's new, pussycat?" to Selina Kyle probably isn't a great way to make friends with her. I'm sure that Tom Jones gets a pass, though. That guy's pretty smooth).